Come explore the incredible world of the whale shark and enjoy the experience of a lifetime with the Whale Shark Discovery. The Whale Shark conveys peace and tranquillity; swimming alongside this gentle giant of the sea in Mexico is an experience to remember and share again and again. The whale shark is completely harmless to humans, it is actually a very docile and curious creature. In summertime hundreds of whale sharks swim to the waters surrounding Isla Mujeres, Isla Contoy and Isla Holbox, to feed on plankton where the Caribbean Sea meets the Gulf of Mexico. From end of May to middle of September, you will have the remarkable opportunity to swim and snorkel with these amazing animals, in an area teaming with sea life. Our boats are leaving daily from Cancun to get to the whale sharks area between Isla Mujeres and Isla Holbox. Our experienced bilingual guides will make your whale shark swimming or watching experience the highlight of your holiday. Whale shark watching in Cancun, Mexico – a unique experience you will never forget. Join us in this amazing adventure! Language: Spanish, English, French, German, Russian, Italian, Portuguese and Dutch. *If you wish to include children please let us know when making your reservation. We work with the best whale sharks tour operator in the Riviera Maya. We guarantee an excellent high quality service to ensure the total satisfaction of our clients. 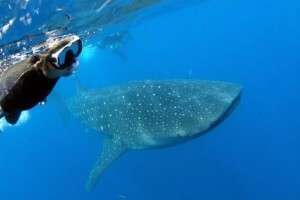 We have over 7 years of experience with whale shark tours as we started in year 2008. We are professional. Our guides are enthusiastic, experienced and knowledgeable. The whole team will make your tour unforgettable. We have 3 crew members on each boat to ensure your total satisfaction and to assure you swim as much as you like: captain, sailor/guide, bilingual guide/photographer. Working with small groups of clients, max. 10 people per boat ensures you a familiar private tour feeling. We are safe. The Speed boats are very safe and comfortable (with whale shark operating permits). We provide high quality snorkeling equipment. Using water release valve silicon snorkels makes it a lot easier to breath in the moment you swim with the whale sharks. We won’t limit you. You can swim as many times as you want with the whale sharks. We go the extra mile. We try to spot Dolphins, Turtles and Manta Rays for you to have the best experience. We are there for you. We offer you biodegradable sublock on the boat in case you don’t bring your own. 7.30 – Pick up from your hotel in Cancun ( aprox. 6.20 Playa Del Carmen, 5.45 Tulum). 7.45 – Arrival at our meeting point at the boat pier in Cancun (Marina Las Jaibas). 8.00 – Light breakfast buffet at the pier in Cancun. 8.15 – Departure from Cancun meeting-point , our Certified Bilingual Guides will give you an informative briefing about safety and how to swim with the whale sharks. 9.00 – We arrive in the whale shark watching area. When we find the whale sharks, we gear up and we swim with two guests and the guide along with the whale sharks. We take turns and you can swim as many times as you want. We stay approximately 3 hours in the whale shark swimming area. 14.30 – Return to Cancun (Where our drivers will be waiting for you to bring you back to your hotel). Lunch with sandwiches, shrimp ceviche, guacamole and fruits *If you are vegetarian or allergic to something please let us know when making your reservation. Come explore the incredible world of the whale shark and enjoy the experience of a lifetime with the Whale Shark Discovery. Federal Tax of $5 usd is included in the price. Snorkeling in a Cenote is a unique experience. These caverns are windows to the world’s largest underground river system. Their water is so clear that the visibility is amazing.